I hope that Hackney is being sufficiently environmentally well behaved of late – and not causing you & your team any extra work. I tried to contact you many times today - but the phone just rang & rang. I’m writing on behalf of several residents concerned about recent noise & dust levels over the canal. As a resident neighbour of the Olympic park – I am finding it increasingly difficult to hear myself think during the day – and have to blow my nose of disgusting gunk many times a day. I’m aware that both the ODA & Thames Water are sharing Arena Fields for the foreseeable future – and we as lay neighbours have no way of distinguishing who is doing what. But that is slightly irrelevant – as all work is being carried out in the Olympic park – and as such – needs to be seen to by you. The mission-creep I have spoken to you of many times - has returned in the now 7.30am trucks running along Arena Fields. The agreement was for an 8am start for heavy machinery to fire up their engines. During the day – the noise levels are extremely high – and we urgently need your mobile noise monitoring team to come down & check their levels. (On that – please contact me for a key for the new lock – as somebody vandalised & stole the old lock & chain). Of course no-one can predict the weather – least of all us gardeners. But a major construction site should have all manner of mitigating measures in place for any eventuality. The ODA have a few bowsers trundling along the ring road every now & then – which I suppose is for their own drivers dust free journeys. All the dust lifting off and landing in our lungs is coming straight off the huge mounds of sand on Arena Fields. Occasionally we have seen some kind of sprayer trying to dampen down the mounds – but not anywhere near enough! When you stand up on the riverbank – you can actually see the sand being blown across into Leabank Square. There is absolutely no attempt by the teams working right up against the electric fence to water any of their earth-works down at all. All the neighbours I have spoken to have said that there has been a marked increase in dust inside our homes. Robert – I really try to keep our correspondence down to reasonable levels – but things are building up to a peak again. We all received the Thames Water flyer this morning about extended working hours on this & next weekend. I thought the agreement was for any extended working hours inside the Olympic park to be flagged up at least 2 weeks in advance – so that we can make some alternative arrangements for our noise & dust free evening meals? How did this arrangement slip through your normally tight net? They chopped down our orchard & nuttery in Arena Fields. The intimidating electric fence was put up with intrusive CCTV cameras. The temporary ring-road took more green space away. The massive grey drab media centre was constructed directly in front of us. The temporary welfare centre was plonked in front of us. The temporary welfare centre was demolished. The last trees were felled. The water main is being dug up & replaced. The massive temporary journo’s catering compound is being constructed directly in front of us. Robert – there isn’t another part of the Olympic park that has had so many different activities happen in such a concentrated area. And as far as we can tell – this was all done with the bare minimum noise & dust mitigation. No matter what readings their gadgets have given – we can hear the noise – and feel the dust – and both are way higher than any of our friends who do not live in Leabank Square quality of life. I trust you will look into the concerns we have – and get back to me as soon as possible. My name is Sóna Abantu-Choudhury and I live in Leabank Square in Hackney Wick. This is directly opposite the new water mains you are busy laying along the Lea River Navigational Canal in the Olympic Park. This morning we all received a flyer from you stating that you have received Hackney Council permission to work all the way through this & next weekend. Several of us residents have spent all day calling the number on your flyer - but had to listen to your music instead. We all object to these new construction times in the strongest terms!! The work you have been carrying out along the canal has been exceedingly difficult for us to bear for the past few months – and we’ve bared & grinned it – in the hope that you would just get on with it and finish the work as soon as possible. This has obviously not happened! This weekend we have planned an annual barbecue on our riverbank – for which we are frantically trying to contact as many residents as possible to postpone. We had always had an agreement with the ODA that any weekend work would be given in writing to us at least 2 weeks in advance – so that this kind of thing simply cannot happen. In addition to this – your workers have never ever seen fit to provide any kind of mitigation whatsoever while carrying out this pipe laying. There has never been an attempt to erect any sound barriers. There has never been an attempt to water down any of the sand & dust you create. This is making our lives completely unbearable – and now you want to do it on the only days we have free to enjoy a barbecue. Please reflect on all this – and get back to me with a suitable reply. Thanks Sona. It covers all we discussed. Let me know what they say. Pity they don't answer their phones hey? Bit too tame as I remember. What about all our swear words? Still, I hope they get the message. Oh Godddddddd!!!! I can't stand this noise anymore!! I tried as well and spent 3 hours on the phone with crap music from thames water! Why put a number on the paper if you don't answer?! Shona did you find out why they have to bash the ground so loudly? What is that all about? What about item 6? Did we want to keep that quiet or are we still going to mention it? You know I think the olympics are sneaking in some extra work on Arena Fields under the thames water flag today. Aren't they also sposed to stop at 2pm on Saturdays? Bloddy typical. What happened to Kavuma? He used to get our backs. Why is he giving the limpdicks the right to mess our weekend up? This letter really is not on! What happened to 2 weeks notice? When did Robert give up on us like that? I think its about time we get the media all whipped up again. I think we should show these bad guys up in front of the press again, see how they like it again. And what with all the gravel man? Didnt that TW geezer tell you that they would replant some smaller trees in place the ones they chopped down? They seem a bit too closely related to the ODA people no? But its Sunday dude! Howcomes I never got one of those flyers & had to check our blog to find out whats happening? Are the ODA scrimping on postage again? Come on! Its the only day I get to lie in & I gotta be woken up by these jerks?! they will email you by 25/07/2011 at the latest. the case I will ensure you are kept informed of the progress being made. Thank you for your patience while we look into this matter. For your reference I have attached our quality promise leaflet. If you ever get thru to that thames water geezer, ask him why there are never ever any sound barriers up between us and them. They keep smashing the pipes or something in the ground and it just comes straight into my little ones bedroom window. No barrier at all. Why is it always us who have to bear the brunt of the olympic building? Have you seen the monstrosity that the welcome trust are planning for Arena Fields? Thats easy another 4 years worth of noise and dust right in our faces again!! And what the hell happened to the playing field that we were promised? The whole circus of them don't know how to talk straight. Again. What's with the 7.15 start this morning? Get that HC suit down here with his video camera man. There they go with that bloody banging again. Why no thought of a sound barrier at all? Sona whats that very loud drilling on the new media bar and cafe? They are drilling on the steel beams they are erecting and its going through my teeth. Shona can you ask them to oil those catterpilla tracks on the diggers they are using please. Its like fingernails on chalkboards all day long. Robert Kavuma left along with many others when Hackney had their spending cuts. the entire team that you used to deal with has gone. Thanks anon. So where does that leave us all now bro? Did the TW guy even bother to get back yet? being carried out over the weekend. to do with us, and they are in relation to the adjacent Olympics Park. will be pleased to assist. Sona, when are you going to manage to get Meg Hillier to do anything for you? She gets paid a lot of money to represent you lot. Sona, now the one year run-in period has started, the foreign media are going to start getting interested in how things are going, and one of the things that some (perhaps the French in particular) are going to want to know about is how well London has done in living up to its promises. Since you have been lumbered with the media centre, you might as well take advantage of the fact that all these interested media people are going to spend the next twelve months finding out where they're going to be based. Why don't you draw up a long list of the major foreign newspapers who are going to be attending - Le Monde, New York Times, etc., lots more - and invite their Olympics correspondents, as part of their coverage of London's final preparations, to come and meet the future neighbours and learn a little about life and times in the area. The Olympics have treated you all abominably. They've made a big deal out of all their successes. They didn't care less what the cost was going to be to other people. They knew they were going to screw you in order to get what they wanted and that's just what they've done. Perhaps the rest of the world that gave us the Olympics needs a little reminder that you ended up paying for the present they gave London. Did you see the inspired little piece about the spirit of the legacy by Ian Sinclair on Newsnight last night? Leabank Square Swans - The Latest! 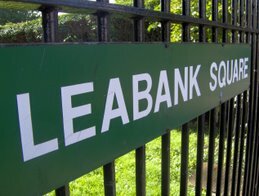 Olympic Legacy - Leabank Square's Concerns.